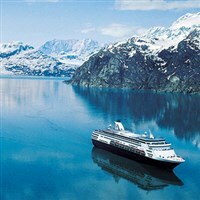 Join Van Galder and Holland America Line on this ultimate Alaskan cruise adventure! ANCHORAGE: Soar away to Anchorage and transfer to your downtown hotel. Take a deep breath, because your adventure is about to begin. DENALI NATIONAL PARK: Your day starts with a train ride to Denali on a domed railcar, so you won't miss a single sighting of caribou, moose, or bear. Along the way, guides will charm you with stories of what life is really like in our 49th state. (And just try to stump them with a question ... we bet you can't!) You'll arrive at Denali in the afternoon and settle into the lodge. The evening is yours for exploration. You can even book an excursion late into the evening because, remember, you've got 20 or so hours of daylight in the land of the Midnight Sun! DENALI NATIONAL PARK: Board the park transportation to take the fascinating Tundra Wilderness tour (included) deep into Denali National Park. 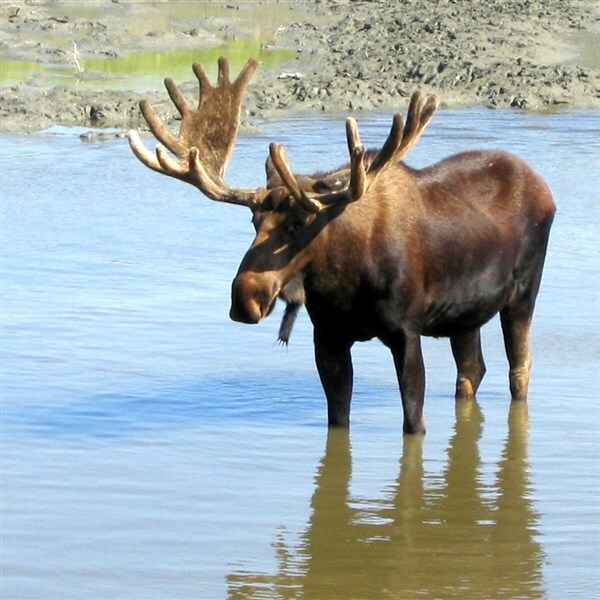 This 6-8 hour, fully narrated excursion is your very best chance of seeing both Denali, in all her glory, and the wildlife that calls "The Great One" home. Don't forget your camera and binoculars! FAIRBANKS: After a motorcoach ride to Fairbanks, you'll get a trip through gold mining history with a stop at Gold Dredge 8. You might even strike it rich as you get to pan for gold yourself, too. WHITEHORSE: You'll arrive here via motorcoach, and have time to choose an optional adventure or simply take in some local shops and restaurants at your leisure. Optional excursions may include a dog sled camp, a city tour, a wildlife preserve, and more. SKAGWAY: Getting to Skagway is part of the fun via rail! 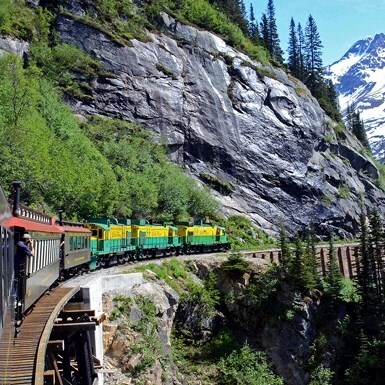 Ride the historic White Pass & Yukon Route Railroad through some of the most jaw-dropping beauty: through tunnels, over sky-high trestles, and through remote valleys. In Skagway, you'll board the ms Nieuw Amsterdam to begin your cruise and be treated to the wonders of Alaska that are best enjoyed by sea. AT SEA: GLACIER BAY NATIONAL PARK. Cruise in awestruck wonder in Alaska's premier glacier viewing region, with more calving tidewater glaciers than anywhere in the world! A National Parks Service Ranger narrates as you listen to the sound of the glaciers crashing into the sea. 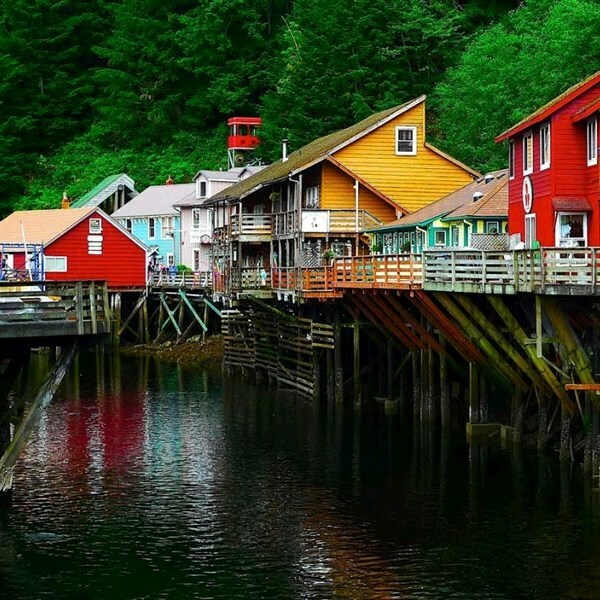 KETCHIKAN: Discover the town rich in native culture, home of the scenic Misty Fjords National Park, and known as the "Salmon Capital of the World." A full day in port! Choose an optional excursion or hang out in town ... you decide! AT SEA: INSIDE PASSAGE. Watch this playground for orcas and humpbacks ... known as one of the most scenic sea lanes in the world! Take in the nature's beauty and the elegance of Holland America Line one last time as the cruise nears its final port. VANCOUVER, BRITISH COLUMBIA: Morning disembarkation in Vancouver, British Columbia, then transfer via motorcoach to the airport for the flight home. Start savoring the memories you've made on this trip of a lifetime! DEPOSIT: $600 per person due at time of reservation; second deposit of $500 per person due Jan. 28, 2019; final payment due May 17, 2019. Once payments have been received, stringent cancellation penalties apply. TOUR INCLUSIONS: Professional tour director, roundtrip airport transfers, roundtrip air/land/ship accommodations, air and port taxes, onboard meals (excluding specialty dining). TRAVEL INSURANCE: Highly recommended, cost based on cabin type. PASSPORT: Valid for six months after departure from Vancouver, BC, is required. ADDITIONAL FEES: Airline luggage fees, fuel surcharges (if applicable), shore excursions, and daily shipboard gratuities.